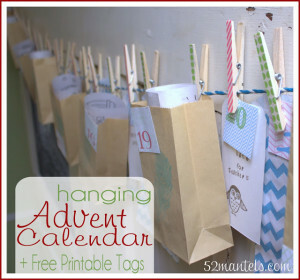 Hanging Advent Calendar + FREE Printable Tags! 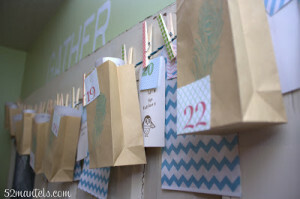 You are here: Home / Holidays / Christmas / Hanging Advent Calendar + FREE Printable Tags! Emily is back with her awesome holiday crafts! 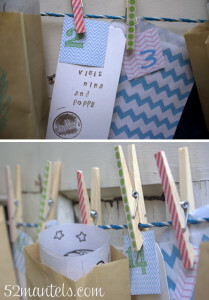 This week’s “Making A Merry Christmas” craft – Hanging Advent Calendar + FREE Printable Tags! I placed my advent calendar across a large door-turned-chalkboard in my kitchen. It’s the perfect spot for adding Christmas cheer, but well out of reach of tiny hands. Momma gets to control the advent calendar! 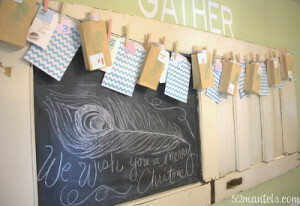 I started with a turquoise clothesline from Dollar Tree. 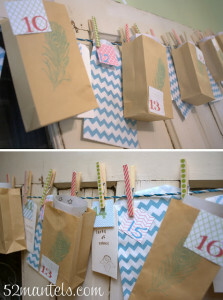 To that, I added 8 kraft bags (stamped with a peacock feather), 8 hanging white tags and 8 chevron treat bags. I attached it all to the clothesline with clothespins. I then attached my number squares. Easy peasy! What’s in my bags? Well, I decided we’d focus on creating memories by doing activities together as a family and with our friends. With that goal in mind, each day has a different activity attached to it. In the kraft bags, I’ve simply placed inside one Christmas-themed coloring sheet because my daughter LOVES to color! On those days, we’ll have some mommy/daughter coloring time. I’ll use this activity to chat about the meaning of Christmas and spend quality, focused time with my little punkin. On the tags and in the bags I’ve written various activities including: checking out Christmas books from the library, having our playgroup friends over for a Christmas party, visiting grandparents, adopting an angel tree angel and several others. I chose things that we’d likely be doing anyway and, because the tags are moveable, I’m free to swap activities whenever I want! 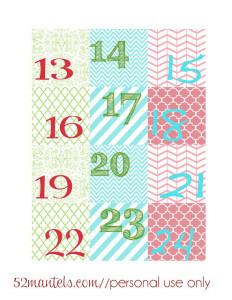 If the thought of coming up with 24 activities is overwhelming to you, consider doing 12 days of Christmas instead. My clothespins came from Dollar Tree in a pack of 36. I simply placed a piece of washi tape on each one and trimmed the excess. Easy breezy! Feel free to grab my printable tags below! To use them, right click each image and save it to your computer. They’ll print on a standard 8.5″ x 11″ piece of card stock. 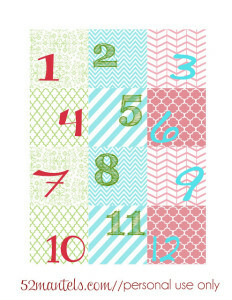 To see another Advent Calendar and grab those FREE printable tags, click here. 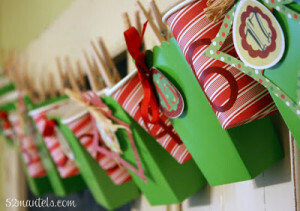 Check out more holiday DIY projects!